Missing Reels examines overlooked, unappreciated or unfairly maligned movies. 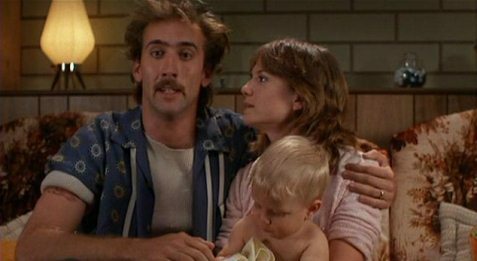 Sometimes these films haven’t been seen by anyone, and sometimes they’ve been seen by everyone… who loathed them. Sometimes they’ve simply been forgotten. But in any case, Missing Reels argues that they deserve to be seen and admired by more people. With the easy delivery of films via Netflix, Amazon, Hulu and a host of other choices, it’s easy to feel like you’ve seen everything. This feeling can be especially true when looking at mainstream films which have a sameness to them that permeates the medium: the same tropes, the same familiar group of actors, the same story points endemic to the genre. So in order to find something new, something unlike anything you’ve seen before, you should seek out more independent flair, as there’s no focus group to market those. Although indie films have their own clichés that rise up in waves every few years, depending on which indie darling is making a splash currently and getting studio gigs or selling out at Sundance, there’s still a better chance of finding something unique in the rogue filmmaking of outsiders than possibly what could be made by most studios. And you don’t have to look for the most recent films to find something new or pushing the envelope; there are plenty of undiscovered gems from the past as well. And for those that feel like they’ve seen everything but haven’t watched 1980’s “Forbidden Zone?” Then brother, you ain’t seen nothing yet. “You don’t even have to be a fan of the music!” That’s a lie that people often spread about music-centered films. Whether it’s a biopic, a documentary or a concert film, fans of the movie will insist that, in order to like it, viewers don’t even have to like that particular artist’s music. It simply isn’t true. If you don’t like Ray Charles music, then those recording sessions in “Ray” will seem fruitless; if you’re not a fan of The Talking Heads, then “Stop Making Sense” is an interminable bore. No matter how well crafted the film is around those scenes, or how well shot the performances are, if you don’t dig the music on display, you won’t really like what’s happening on screen. 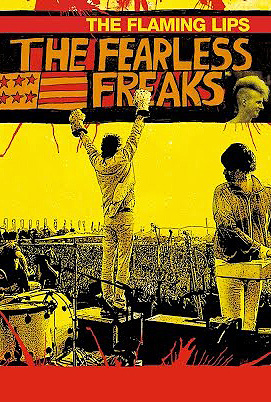 So I won’t repeat that lie here about the music of The Flaming Lips when watching the documentary “The Fearless Freaks.” I will, however, say that there’s a lot more going on here than just the music, which is true of the band itself. The Flaming Lips have always been about the experience, whether it’s their four-disc Zaireeka album played simultaneously, or their freak-out concerts, and the same goes for the documentary which covers their odyssey from crappy punk band to psychedelic musical masters. It helps if you’re already partial to some of their music to enjoy this film, but if not, then hopefully you can enjoy its simple story and arresting images. Hong Kong has long been the source of lots of great action, from the Shaw Brothers’ kung fu epics, to John Woo’s ultra-cool crime stories of the ’80s and ’90s. But while many people may think that the action scene has moved on to other parts (mostly Thailand and South Korea, plus a mini-boom of excellent American direct-to-video films like “Universal Soldier: Day of Reckoning” and its ilk), there’s still a lot to offer from the once reigning king of cinematic punches and gunshots. Johnnie To is most famous for his “Election” films, gripping crime dramas about rival gangs and who controls them, but before he made those, he directed a film (with Wai Ka-Fai) that oozes charm, a clever narrative structure and excellent action sequences. 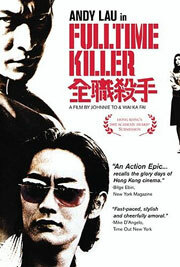 2001’s “Fulltime Killer” is the story of two rival assassins: O (Takashi Sorimachi) is a methodical and utilitarian killer for hire who dispatches his targets with a cold, emotionless disconnect; Lok (Andy Lau) is a flamboyant slayer of men who is inspired by western action flicks and makes each kill an operatic masterpiece of mayhem. O is the top assassin in Asia, given the big paying jobs because he always gets them done and remains steps ahead of Interpol. Lok is sick of living in O’s shadow and decides to target the top dog by first integrating himself into O’s life, then by taking out O’s targets himself, before eventually directly confronting the killer. It’s a blend of the cool of John Woo’s “The Killer,” the tense buddy relationship at the heart of “Hard Boiled,” mixed with the self-reflective skin of a Tarantino bloodbath.